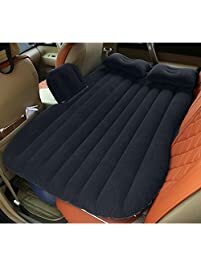 Today I'm reviewing the car air mattress bed and I'm doing a little video on it to see and to show you how it works as you can see I have half of it inflated right now i'll get to that part but this set comes with a carrying bag a nice little carrying bag that you can keep it safe in your trunk comes with two pillows here is one inflated and then the deflate in one. 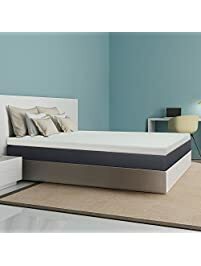 Comes with those whose and then it now comes with the mattress um there's two spots where you need to inflate it um the actual bed part and then i'm going to show you demonstrate this bottom part that actually holds it up in between the seats. 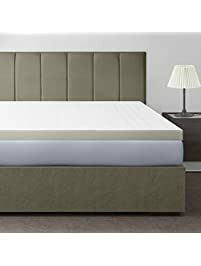 You're not falling the mattress itself is a nice soft almost velvet like it's pretty comfy um on the underneath it's just the typical and blow up material um I love how. This is smooth. You can lay on this you don't even really need a blanket there is also this spot where you know you could tuck it in the seat or just easy to hold it by without puncturing the mattress um let me get down to this port you can see it comes with this plastic piece or that um I put it in there to inflate it because it didn't let the air out this way um alright how are doing this one-handed and then the set also came with the inflation pump which you just plug into your car for charger port and. This is an AUSA always off the dash is on you want to connect the nozzle the one with inflatable to it and you just turn it on and it works. I'm going to try to do this one handedly and show you how the fundamental eights you know this took maybe 15 seconds to inflate it's really fast and convenient. I'm going to try to do this and film. You just put in the inflation for and alright. This is hard should you want him to internal as you can see is starting to inflate alright. Just shut the pump off when it's inflated fully and as you can see it's staying and playing because of that white plastic piece and then you just shut it you sauce if you're going in like blowing up a and like I met I'm sorry I swim raft and there you go your mattress is in place sturdy I can lay on it new cozy it makes it nice for overnight um if you don't have anywhere to stay or if you just want to set this up while you're out camping or at the picnic or somewhere you know your kids want to sit in the car and you don't have to put them in the car seats or whatnot you slam here turn on the air and you're good um. Yeah and now there's also and the deflation port which I haven't tried this yet. We'll see how this works I believe just Oh unplug that plastic piece and it's kind of deflating on its own plug that in it deflates it on its own I was really neat I don't have to sit there and squish it and press it to deflate it um. Yeah. This is such a great deal and it's very sturdy very comfortable I love the color the bright green. This is such a fun little set that's easy to carry around and. Convenient to bring with you anywhere you go well thank you for watching.